I have high expectations for all of my students…because they need to know they can meet them. I expect a lot from them…because they need to be ready for high school and success beyond. I press them to go further than mediocre…because they need to show their best. I keep pushing them to revise and try more…because they need to learn that work is involved in improving. I want them to remember what they’ve learned…because they need to use what they know for their futures. I want lessons to work out…but sometimes they don’t. I hope for new ideas to go well…but sometimes they surprise me and surpass even what I expected and hoped they could do. I plan for certain things to happen…but sometimes they surprise me and show depth of thoughts and honesty and emotion in poems that I never would have expected. I am thankful that we are Slicing this month…but sometimes I wish it was all year…because they have grown so much in only 13 days of writing…and I can’t imagine the impact it would make and growth we would see if they were to do it all year. That's so great that they have already grown as writers in just a short time! You could totally do this all year! 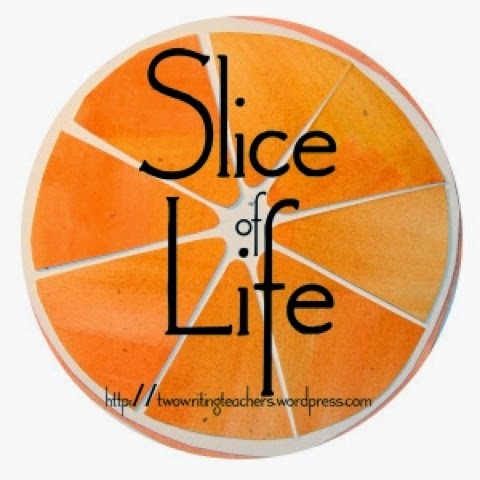 Have them slice in your classroom and post them in the room or on a bulletin board and other students and teachers can comment on their writing using post it notes! We do that at my school! This is the joy of teaching - they surprise you when you least expect it. Bless them!